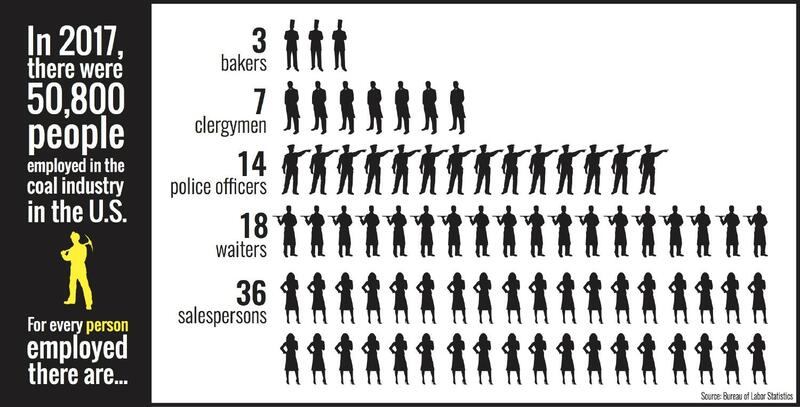 How big is coal mining compared to other occupations? By Louis Jacobson on Friday, July 21st, 2017 at 8:00 a.m.
At an event to tout his "Made in America" agenda, President Donald Trump took a moment to applaud his administration’s success in stopping the long-term decline of the coal industry. "We picked up 45,000 mining jobs in a very short period of time," Trump said. "Everybody was saying, 'Well, you won’t get any mining jobs.' We picked up 45,000 mining jobs. Well, the miners are very happy with Trump and with Pence, and we’re very proud of that." In June, Trump’s Environmental Protection Administration chief, Scott Pruitt, said something similar. "Since the fourth quarter of last year until most recently, we've added almost 50,000 jobs in the coal sector. In the month of May alone, almost 7,000 jobs." We rated that Mostly False. In fact, the Bureau of Labor Statistics counts 50,800 total coal mining jobs in the United States. The increase since Trump took office? 800. Rather than fact-check such a similar claim again, we thought we’d do something a little different: We decided to put the size of the coal-mining sector in the context of the broader economy. To determine the comparative size of various occupations, we used Bureau of Labor Statistics data to pull the employment figures for a wide variety of jobs -- both common jobs and rarer jobs, blue-collar jobs and white-collar jobs. In the accompanying infographic, we show employment figures for 2016 in a selection of occupations, ranging from the smallest number of workers at the top to the largest at the bottom. It is perhaps understandable why Trump has given so much attention to the coal industry. 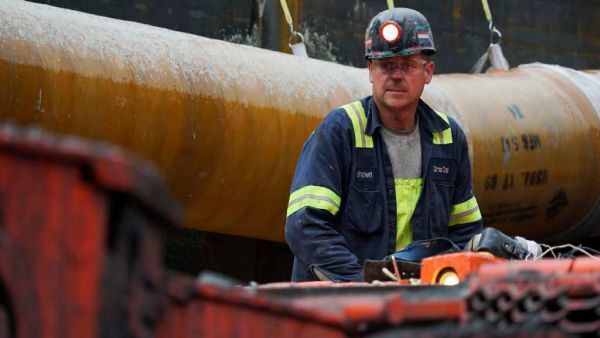 In a number of places where he fared especially well in the 2016 election -- notably Kentucky, West Virginia, and the western portion of Pennsylvania -- coal is a significant driver of the economy, despite the industry’s long term decline. And declines in employment in such areas have brought real hardship. As recently as 1986, coal mining employment totaled 178,000. So it’s been a 71 percent decline in coal employment just over three decades. Analysts generally attribute this shrinkage to such factors as stiffer competition from natural gas and advances in technology. 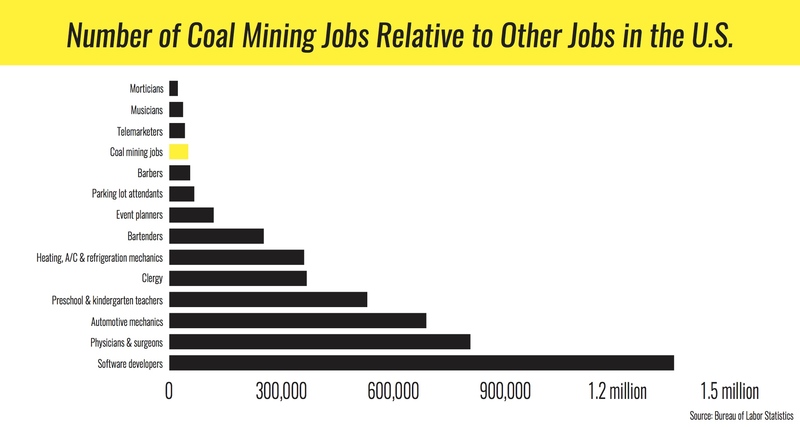 In addition, the coal industry has argued that the BLS figures undercount total coal-industry employment due to seemingly arbitrary definitions of what qualifies in a given category and what doesn’t. However, the same problem would likely affect many of the other occupations on our list as well. In any case, our comparison at least gives some sense of the relative economic clout of coal mining and other economic pursuits. Here’s the full list with links to the original data.